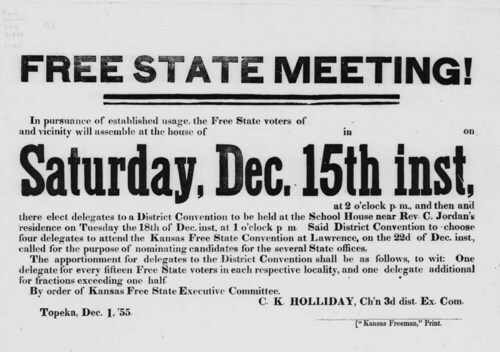 Photograph of a broadside announcing the election of delegates to a District Convention where delegates were to be chosen to attend the Kansas Free State Convention at Lawrence. The announcement was "by order of the Kansas Free State Executive Committee, C. K. Holliday, Ch'n 3d dist. Ex. Com., Topeka, Dec. 1, 55."